Kiki Health Lecithin is from 100% soybeans which is the richest source of lecithin. KIKI believes in adding only the purest of ingredients with the highest potency available. All ingredients are meticulously chosen and ethically processed to preserve and maximise the beneficial and powerful elements, ensuring unsurpassed bioavailability. KIKI does not compromise their products with inexpensive fillers and synthetics. ✓ Allows fat and water to mix. KIKI’s Lecithin is derived 100% from soybeans that have NOT been genetically engineered or modified. Lecithin can be used as an emulsifier, thickener, stabiliser, moisturiser, and mild preservative, and it helps to improve moisture and texture in a number of food and home-made beauty products. It is a healthy vegan alternative to fat in baked goods. 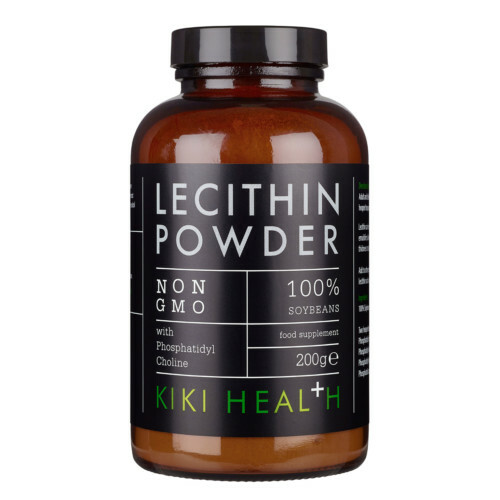 KIKI’s Lecithin Powder is made from 100% soybeans which is the richest source of lecithin. Lecithin is a phospholipid, composed of choline and inositol and is a necessary component of every cell in the human body. Adult intake: one (1) – two (2) tablespoons per day. Add to any drink or smoothie, sprinkle on / or mix with foods for an extra creamy flavour. If using as a thickening agent, allow 10 minutes for full thickness to take effect.